Stage designer, graphic artist, painter. born in the family of an official of the Ministry of Justice, a native of Sweden. In 1892-1903 attended various schools in Yerevan, Tbilisi and Kiev. In 1903-1908 he studied at the Kiev Art School and took private lessons with FA Roubaud. Since 1907, cooperated with the newspaper "Thought of Kiev, where publishing his cartoons. In 1908 he moved to Munich, continued his education at the Munich Royal Academy of Arts and Studio G. Knira. From 1912 he lived in Paris, worked in the studio A. Bourdelle. Exhibited his work in spring and autumn salon, salon Independent in Paris. In 1914 he returned to Kiev, in 1917 he moved to Moscow. In 1918-1919 after a brief stay in Odessa he returned to Kiev. Some time was an assistant in the studio of Alexandra Exter. He worked as a constructivist and cubists-futurists. In 1919 participated in the design of the town for the holidays and the Red Army on May 1. Worked with Bronislava Nijinska, creating sketches of scenery and costumes for its productions, in particular the "Mephisto Waltz" and "Fear». In 1921-1923 he worked at the Kiev Opera and Ballet Theater. Shevchenko. Since 1922 at the invitation of Les Kurbas designed the productions at the Kiev State Theater Berezil ", among numerous works Muller for this theater set design stands out performances of" Jimmy Higgins "(1922)," The Mikado "(1927) and" Death Squadron "(1933). Collaborated with other theaters of Kyiv, in particular the theater Gnat Mikhailichenko ( "Carnival", 1923). 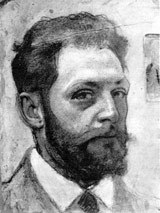 In 1924-1925 he worked as an artist, movie and book illustrator. In 1925 he was awarded a gold medal at the International Exhibition of modern industrial and decorative arts in Paris. In the same year participated in the International Exhibition of Performing Arts in New York. Some time he taught at the Kiev Art Academy together VE Tatlin and AK Bogomazova. Entry into the Association of Revolutionary Artists of Ukraine. In 1926, together with the theater troupe "Berezil" went to Kharkov. After World War II headed the Institute of Painting and Sculpture of the Academy of Arts of Ukraine. In 1948 was appointed chief artist of the Kiev theater of musical comedy. In 1953-1959 headed the art of the theater to them. Ivan Franko in Kiev. buried at Baikove cemetery in Kiev.